Wide Brim Hosta has dark green leaves with irregular, cream-colored margins and lavender blooms in the summer. Hostas are extremely popular, hardy herbaceous perennials grown primarily for their beautiful foliage. They are easy to grow, shade-tolerant plants. The plants are low maintenance. Hostas originally came from Japan, China, and Korea. They were first introduced to Europe in the late 1700s and then came to the United States in the middle 1800s. Outstanding Features: Wide Brim provides bright color in shady areas. 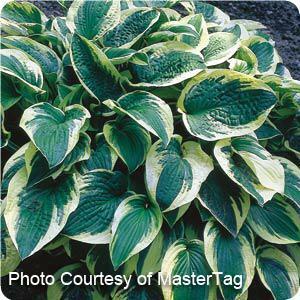 Tips: Spacing should be large enough for the hosta to grow to its mature size which takes about 3-4 years.